Connect up to 33 feet(10 meters) away. Up to 3 Mbps data transfer rate with Enhanced Data Rate (EDR) support. Plug and play，easy to use. Support 1.2/3.6V input and output. 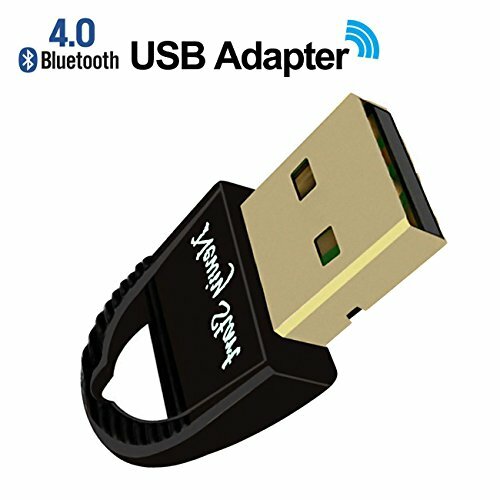 Universal Compatible: The Bluetooth USB adapter is compatible with 32 bit and 64 bit Windows 10 / 8 / 7 / XP, Vista, and etc. The USB Bluetooth adapter is designed for Windows. Plug and Play for Windows 8 and higher system. Driver only needed when your Windows 7 and lower system need to connect audio device. The Bluetooth USB dongle also supports Bluetooth speakers and headphone, Bluetooth Mic, Bluetooth keyboards / Mouse, Mobiles, PC Plate, and more. The Wireless USB Bluetooth dongle adapter supports transmit data and audio files. If your desktop or laptop does not have Bluetooth function, the USB Bluetooth dongle 4.0 can endow your PC with Bluetooth function, you can easily connect a Bluetooth-enabled device. 2 Years Warranty available. Please note: The usb bluetooth dongle is win7 above is plug and play, if you can not use to insert, please pull out first, with CD-ROM installed on the corresponding system driver, and then plug into the use. If you have any questions about this product by Newiy Start, contact us by completing and submitting the form below. If you are looking for a specif part number, please include it with your message.